Do you all remember Fig Newton cookies from when you were a kid? I actually had to go search to see if they're still around and, yup, they sure are. I had totally forgotten about them until the bundt bakers group announced this month's theme of working with jam and I went off to look for inspiration. I really love Bonne Maman preserves and I've usually got a jar of the cherry flavor in my refrigerator. Not that cherry wouldn't have been a fine choice to bake with but I wanted to see what else was available. Truthfully I had been thinking along the lines of a sticky toffee cake, which uses dates, but then I saw a jar of their fig preserves. I instantly flashed on the flavor of those cookies and was inspired to see what I could produce in bundt cake form. The fig jam made the cake wonderfully moist and gave it the most amazing aroma. And, since I still kind of had sticky toffee in my head, I went ahead and gave it a caramel glaze because a little homemade caramel never hurt anything. Enjoy! Add the eggs and sugar to a large bowl and beat together until creamed. Beat in the butter and vanilla followed by the buttermilk and fig preserves. In a separate bowl, sift together the flour, baking soda and salt and slowly beat into the batter. Butter and flour a 12 cup bundt pan and pour in the batter. Bake in a pre-heated 350 degree oven for 1 hour or until a cake tester comes out clean. Allow to cool completely before removing the cake from the pan. Make the caramel sauce by melting the sugar in a pot over a low to medium flame. Do not stir. When the sugar has completely dissolved, remove it from the heat and add the heavy cream. The mixture will bubble up. Return to a low heat and stir vigorously until all lumps are gone and the sauce is a light golden brown. Finish with the butter and sea salt and remove from the heat. 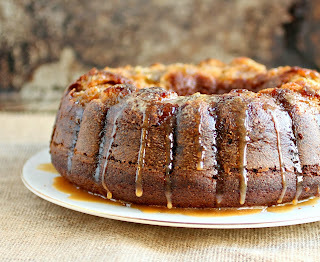 When the cake has cooled, pour caramel sauce over the top and serve the remainder on the side. Makes 10 - 12 servings. I adore fig newtons. So, send me this? Mmmmkay. I've never tasted figs preserve before but looking at your cake, it must be good. Wonderful clicks! I love fig newtons and they make me think of my dad for some reason. 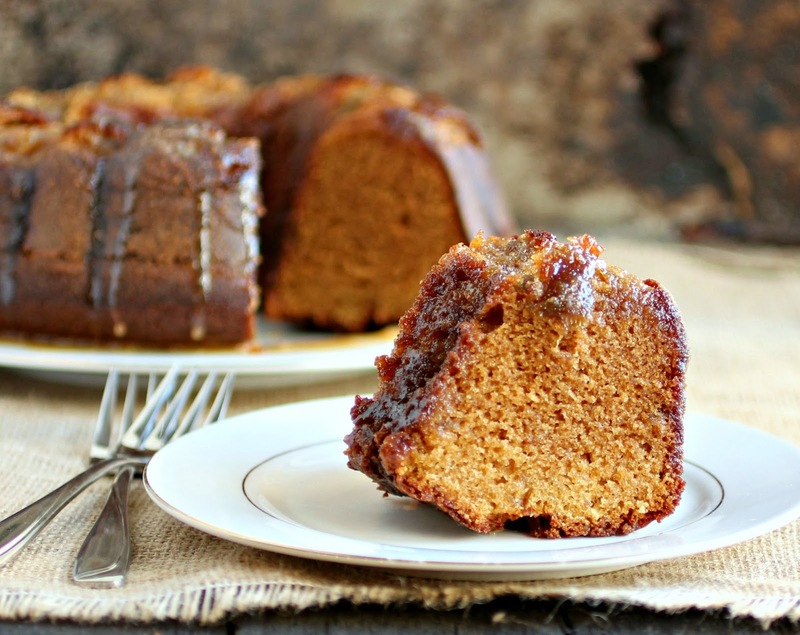 He'd love this cake and the caramel sauce too! LOVE this bundt cake! love that you used fig jam . . and omg, caramel glaze??!! Fabulous. Looks absolutely delicious! I love figs! Beautiful bundt. And it looks SO delicious! And your photos make me want to jump through the screen! Figs are one of my favorite fruits and I haven't had a Fig Newton in ages. This cake is dreamy, Anita. That glaze is perfection! Thank you for baking with us for Jammy November! Yum, yum, yum, your bundt looks delicious!!! Add me to the list of fig lovers. The crazy thing is, I don't like Fig Newtons. 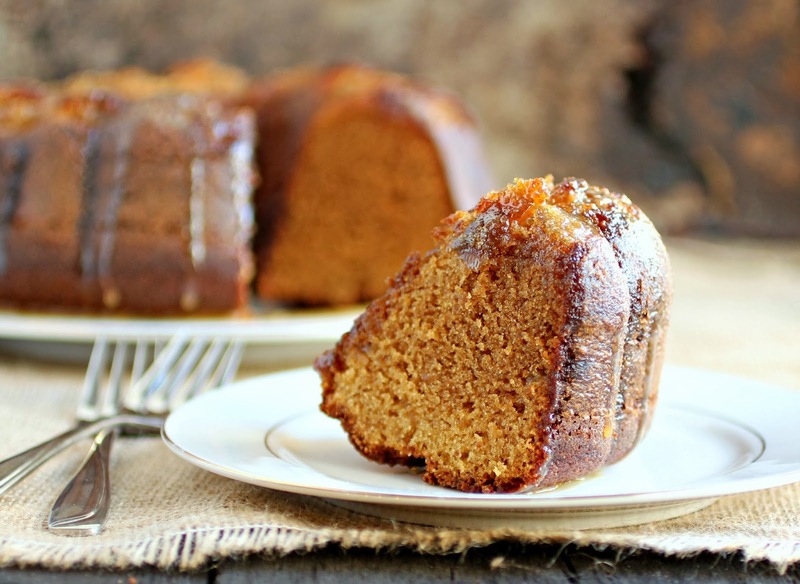 This cake is amazing and you sent me over the edge with the caramel sauce. Anita....I LOVE this cake! I love fig cookies and figs in general and don't bake nearly enough with them. How I wish I had thought to use them for this challenge. It looks really moist! And I bet your kitchen smelled like heaven! And caramel makes the world go round! Funny - I hated Fig Newtons growing up, but I'm guessing it's because it was super processed and not fresh. Now if you'll excuse me, I'm going to grab some real fig preserves and try this. Every now and again I find fresh figs in a store here, but I'm sure I could find fig preserves. I can't wait to try this soon. I am a fan of all things fig but that caramel sauce sends this cake straight into the MAKE SOON zone. Love it, Anita! Love the idea of the figs! And it leads to such a great name! :) Yum! delicious use of fig preserves. it looks great!